You can enjoy frittata any time of the day because of their versatility. Packed with rosemary and tomato flavour this frittata is delicious served up with a crisp salad or served up with some salsa alongside for added kick. Cut potatoes into 1/2 inch (1 cm) cubes and toss with rosemary. In an ovenproof 10 inch (25 cm) nonstick skillet, heat oil over medium low heat and cook potatoes, covered, stirring occasionally for about 15 minutes or until tender and starting to brown. In a bowl, whisk eggs with pepper. Stir in tomatoes and pour into skillet around potatoes lifting up edges to let egg mixture go to the bottom. Cook for about 10 minutes or until edges are set and bottom is golden brown. 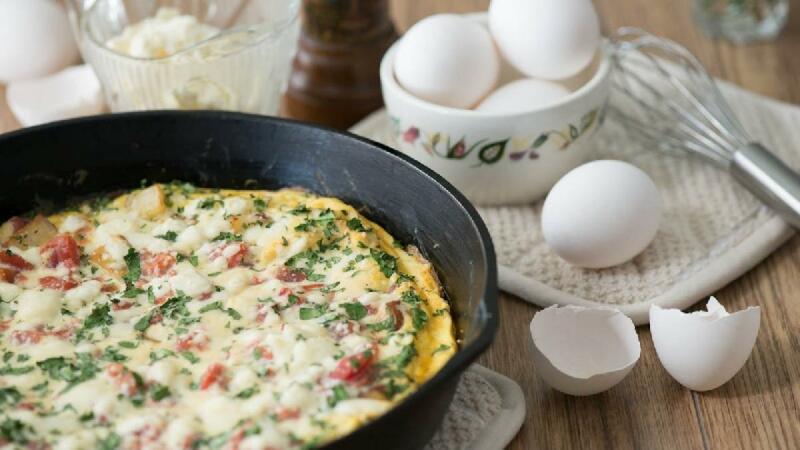 Sprinkle frittata with basil and feta cheese and place pan about 6 inches (15 cm) under the broiler for about 4 minutes or until top is light golden and knife inserted in centre comes out clean. Potato Leftover Option: Use about 2 cups (500 mL) diced cooked potatoes for the raw ones and reduce cooking time to about 8 minutes before adding the egg mixture.